So I’m beginning to realize that “free days” actually don’t mean that you get to relax any more than on “non-free days”. Yesterday Sarah, Chelsea and I decided to museum it up and we went to both the National Gallery and the British Museum (part 1). Since I am a history major and was considering art school before choosing colleges, I absolutely love observing all the details about paintings and artifacts in museums. History has taught me to look beyond the surface, so I am advising you to do the same because you’ll be surprised by the information you will discover! I love looking at older paintings because they tell so much about the period and the people in them. For example, I was observing a portrait of a beautiful 18th century woman, and if I did not read further information about the woman, the painting would have lost so much meaning. The woman in the portrait, Manon Balletti, was actually one of the many lovers of the famous Casanova. Around the time this portrait was being painted, Casanova had declared his love for Manon, but she a few months later got married to another. On the surface, this woman looks demure and captivating, but with further research I now view this portrait differently. Since I love learning about the every-day person and their lifestyle, paintings offer hints into things such as what people ate, what status a person is if a certain object is placed in the picture, how people wore certain types of clothing, etc. Being a historical reenactor as well, observing these paintings are one of the best research methods for a certain period of time. Who would have know that drinking hot chocolate would have been a status symbol in the 1700s? 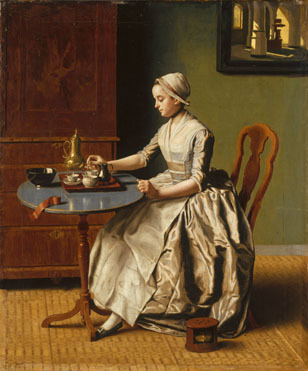 I had known this before, but apparently if a person was painted drinking or pouring a cup of chocolate, it showed that they were wealthy enough to afford such a luxury. Nowadays, we wouldn’t think twice before making ourselves a packet of powedery hot chocolate mix. 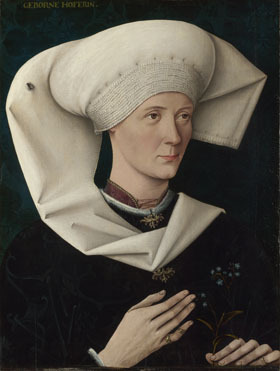 Portrait of a Woman of the Hofer Family, 1470, showed that it is always worthwhile to pay attention to details. If you only walked by and glanced as this painting you would miss the underlying symbolisim behind parts of the painting. In her hands she is holding flowers, symbolicly Forget-Me-Nots, which often signify rememberance. In the left corner of the woman’s headress there is a small fly made to look real. Oftentimes a fly could represent mortality or could just be used to show the artist’s skill of perception. I also noticed that in this painting, and in others from the period, some women wore rings on both of the joints on their fingers (which I think would be awfully uncomfortable!). I have never seen this before in paintings and in this one, if you look at the woman’s pinky finger on her left hand, you can see that she is wearing two rings. Perhaps eventually I will discover why it was fashionable to wear rings like that. It was probably one of those crazy fashion trends of the century. So the next time you rush by an old painting in a gallery or museum, stop and observe it. Ok, so maybe you can’t get past the “funny” headdress the woman is wearing, or the fact that men are wearing bright colored tights, but you can learn so much by looking beyond that. Perhaps you may even discover some parallels to a certain person or time period, such as people for centuries had portraits with their prized pets painted next to them, just like you might have your picture taken wih your favorite pet. One thing I’ve noticed is that organizations in museums often comment on a painting’s psychological meaning, and I’m not entirely sure how they find it. Things like a subject’s clothing, pose, or belongings are easy to pinpoint and analyze accordingly (as you have aptly done, I’m impressed :]), but I feel that commenting on a painting’s psyche is highly subjective. For example, I overheard someone refer to the subject of a portrait as sad. Although it was a flippant comment, I know that some people do feel that they have the authority to dictate what the subject of a painting felt at any given time. I think that’s very open to misinterpretation.